His younger lead guitar-playing brother Angus Young may be the main attraction of AC/DC in concert, but rhythm guitarist Malcolm Young is the band’s musical anchor. Born on January 6, 1953, in Glasgow, Scotland, Malcolm and his family relocated to Sydney, Australia, when he was ten-years-old. Inspired by his older brother, George, who hit it big as a member of the Easybeats (scoring a worldwide smash with “Friday on My Mind”), young Malcolm began playing guitar in local bands, one being the Velvet Underground (not the same VU as the one fronted by Lou Reed). Malcolm married his wife O’Linda early on in his career and has had one daughter and a son with her. He spends most of the year living in the UK, returning to “Oncaparinga”, his home in East Balmain, Sydney, nearly every Christmas. By 1973, Malcolm decided to join forces with younger brother Angus, and after they lent their talents to an obscure recording (Marcus Hook Roll Band Tales of Old Granddaddy), the duo formed AC/DC. Although they went through numerous lineup changes, by the time the lineup consisted of singer Bon Scott, drummer Phil Rudd, and bassist Mark Evans in 1974, the band had already carved their niche (straight-ahead, unglamorous rock & roll) and were signed. The band became a must-see live attraction due to Angus’ wildman persona, but Malcolm created quite an imposing figure on-stage — standing stoically while bashing out Chuck Berry-esque riffs on his battered Gretsch Jet Firebird guitar. AC/DC’s brand of tough barroom boogie created quite a stir with both metalheads and fans of just good ol’ rock & roll who were sick of prog rock and disco — issuing a string of classic albums in the process — 1976′s High Voltage and Dirty Deeds Done Dirt Cheap, 1977′s Let There Be Rock, 1978′s Powerage and If You Want Blood, and 1979′s Highway to Hell. With massive breakthrough success just around the corner, the band was dealt a devastating blow when Bon Scott died from alcohol poisoning in early 1980, but AC/DC regrouped with new singer Brian Johnson, and returned stronger than ever with one of rock’s all-time classics (and best-sellers), Back in Black. The quintet spent the rest of the decade churning out albums and touring the world, but shortly after the release of their 1988 album, Blow Up Your Video, Malcolm realized that a lifelong alcohol addiction had spiraled dangerously out of control. Not wanting to follow in the footsteps of Scott, Young took a leave of absence from the band, and sorted out his personal problems once and for all (his nephew, Stevie Young, filled in for Malcolm during the band’s world tour that year). When he returned, AC/DC picked up just where they left off, releasing one of their most commercially successful albums yet, 1990′s The Razor’s Edge, and continuing their album-tour routine for the remainder of the decade and beyond. 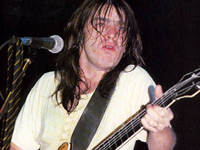 Malcolm Young’s sturdy rhythm guitar style has influenced a legion of hard rock players over the years, namely Metallica‘s James Hetfield and Guns N’ Roses‘ Izzy Stradlin. During the Let There Be Rock era, he stripped the red paint off, down to the maple top. During the Powerage era, he again removed the plastic and stuffed socks in the pick-up cavities, and also changed the bridge from a stock Gretsch trapese tail-piece, to an all-in-one Badass bridge, and put a black piece of plastic over the cavity where the original tail-piece was. During the Highway To Hell era, he removed the socks. The guitar stayed like this until 1995, when, during the Ballbreaker tour, he replaced the Badass bridge with the original tailpiece, removed the pick-up ring that was held in the bridge pick-up. This is how the guitar has been since then. Malcolm uses old Gibson 12-56 pure nickel roundwound strings. Malcolm also owned a 1959 Gretsch White Falcon that was used during the tours that supported the albums, Back In Black and For Those About To Rock (We Salute You). But he said that after someone ‘fixed’ it, it lost the sound he liked it for, and thus got rid of it. It was sold at a rock star items website, a few years ago, along with one of Cliff Williams’s MusicMan bass guitars. Angus and Malcolm Young both use Marshall amps. The amps stacked behind Angus and Malcolm onstage are two 1959 SLP 100 watt heads (reissues to the original Super Lead Plexi). Each head powers four 4 x 12 cabinets. Malcolm also uses custom-made Wizard amps on tour. Malcolm’s main amp since recording Dirty Deeds Done Dirt Cheap in 1976 is a slightly modified Marshall Superbass from the late 1960s or the early 1970s. On Ballbreaker, he used a Marshall JTM100 with KT66s and a high B+ voltage (625 volts). In a recent interview with Marshall Law, Malcolm mentions his two favourite amps – a superbass and old super amp (JTM100). He has also used some Tech 21 amps. Malcolm got an endorsement deal with Gretsch to produce a signature model based on his original guitar. Gretsch now makes Malcolm Young signature model guitars, in single and dual pick-up configurations.